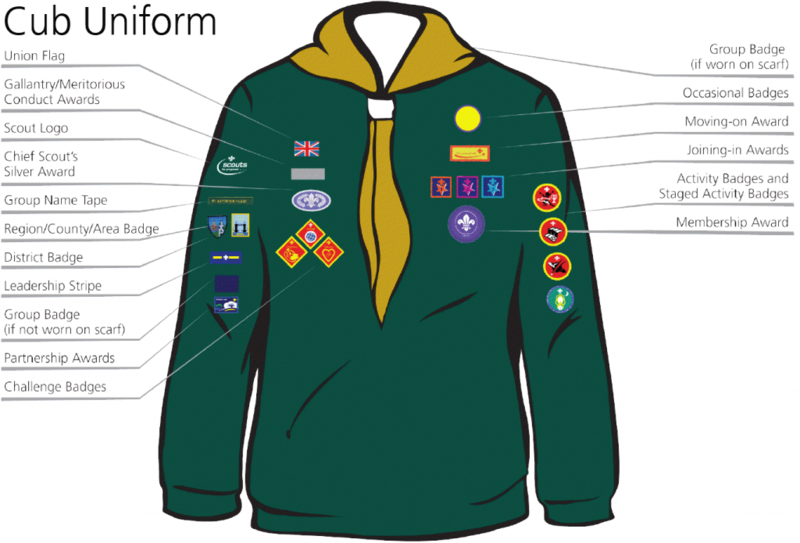 Cub Scouts are the second section of the Scouting movement and are normally aged between 8 and 10½ years old, although a young person can join aged 7½. Our Cub pack is called the “Bumbles Pack” and meets between 6:15pm and 7:45pm on Wednesdays evenings at the Scout Hall. For more information please pop in on a Wedesday evening for a chat with a member of our friendly helpful leadership team, or complete the form below. It costs just £10 a month to be a member of our Bumbles Cub Pack, this is paid by monthly standing order. For details of the badges available for Cub Scouts to earn and their requirements, please follow this link: Cub Scout Badges. For anyone unsure of which badges should be sewn where, please see the image below.